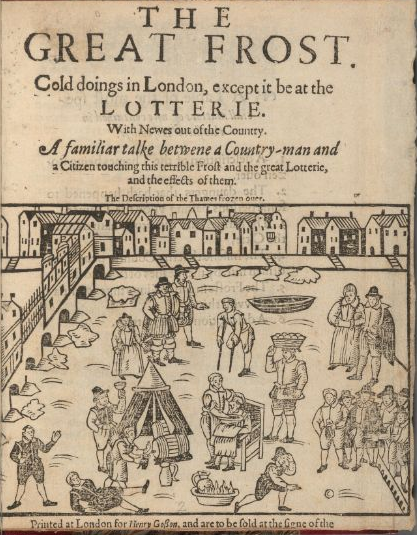 France was particularly hard hit by the winter, with the subsequent famine estimated to have caused 600,000 deaths by the end of 1710. Because the famine occurred during wartime, there were contemporary nationalist claims there were no deaths from starvation in the kingdom of France in 1709. The severity of the winter is thought to be an important factor in the emigration of the German Palatines from Central Europe. One of the key aims of the European Union Millennium Project is climate reconstruction. This objective has gained significance in recent years because scientists are exploring the precise causes for climate variations instead of merely accepting they are within an acceptable historical range. Modern climate models do not appear to be entirely effective for explaining the climate of 1709. 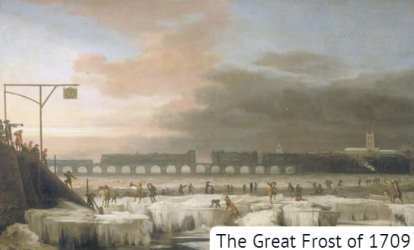 This entry was posted in British history, Great Britain, Living in the UK, weather and tagged The Great Frost of 1709. Bookmark the permalink.